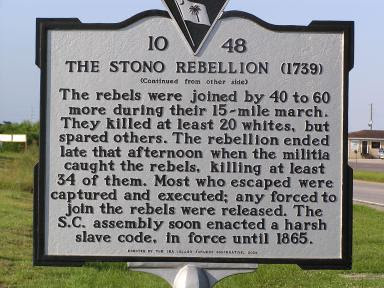 The Stono Rebellion was the largest rebellion mounted by slaves against slave owners in colonial America. The Stono Rebellion's location took place near the Stono River in South Carolina. The details of the 1739 event are uncertain, as documentation for the incident comes from only one firsthand report and several secondhand reports. White Carolinians wrote these records, and historians have had to reconstruct the causes of the Stono River Rebellion and the motives of the slaves participating from biased descriptions. On Sept. 9, 1739, early on a Sunday morning, about 20 slaves gathered at a spot near the Stono River. They had pre-planned their rebellion for this day. Stopping first at a firearms shop, they killed the owner and supplied themselves with guns. Now well-armed, the group then marched down a main road in St. Paul's Parish, located nearly 20 miles from Charlestown (today Charleston). Bearing signs reading "Liberty," beating drums and singing, the group headed south for Florida. Who led the group is unclear; it might have been a slave named Cato or Jemmy. The band of rebels hit a series of businesses and homes, recruiting more slaves and killing the masters and their families. They burned the houses as they went. The original rebels may have forced some of their recruits to join the rebellion. The men allowed the innkeeper at Wallace's Tavern to live because he was known to treat his slaves with more kindness than other slaveholders. After journeying for about 10 miles, the group of roughly 60 to 100 people rested, and the militia found them. A firefight ensued, and some of the rebels escaped. The militia rounded up the escapees, decapitating them and setting their heads on posts as a lesson to other slaves. The tally of the dead was 21 whites and 44 slaves killed. South Carolinians spared the lives of slaves they believed were forced to participate against their will by the original band of rebels. The rebelling slaves were headed for Florida. Great Britain and Spain were at war (the War of Jenkin's Ear), and Spain, hoping to cause problems for Britain, promised freedom and land to any British colonial slaves who made their way to Florida. Reports in local newspapers of impending legislation may have also prompted the rebellion. South Carolinians were contemplating passing the Security Act, which would have required all white men to take their firearms with them to church on Sunday, presumably in case unrest among a group of slaves broke out. Sunday had been traditionally a day when the slave owners set aside their weapons for church attendance and allowed their slaves to work for themselves. The rebels fought well, which, as historian John K. Thornton speculates, may have been because they had a military background in their homeland. The areas of Africa where they had been sold into slavery were experiencing intense civil wars, and a number of ex-soldiers found themselves enslaved after surrendering to their enemies.